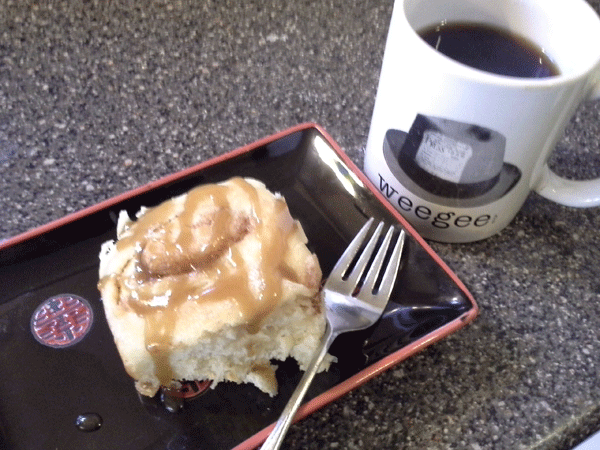 Growing up, I have fond memories of gooey cinnamon rolls and steamy bowls of chili. While most people thing this is an unnatural combination, you would be surprised at how delicious this can be. The fact that it was a monthly lunch option available at my grade school cafeteria only makes the idea that much stranger. Making homemade cinnamon rolls, for me, has always had this intimidation factor. Whenever one starts learning a new crafts, skill or honing a talent, there is often a sense of overwhelming as new vocabulary, theory and practice comes into play. For me and cooking, recipes that include the words “rise” and “yeast” are often red-flag for “way to complicated.” I accept that these recipes are beyond my skill level. For our wedding, we asked friends and family to provide us with pictures of their family and their favorite recipe. 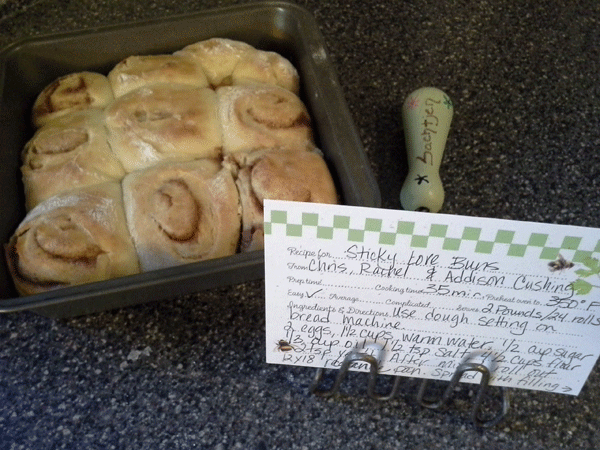 One of Mike’s relatives offered us a hand-written recipe card for “Sticky Love Buns,” which is pretty much cinnamon rolls. 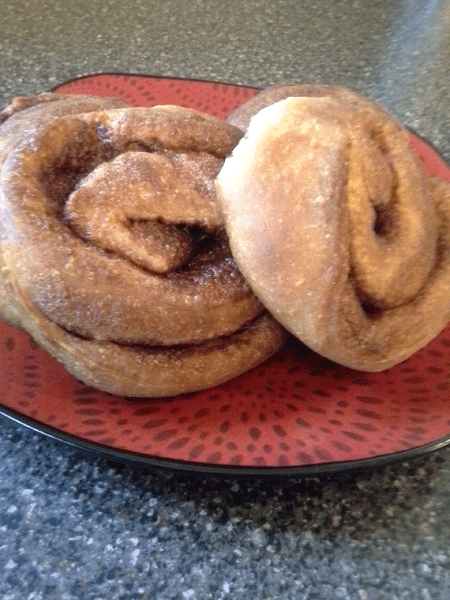 The idea of homemade cinnamony goodness appealed to me and scared the daylights out of me. I pulled the recipe out and stared at it long and hard for a few days. In my head, I was weighing and measuring the difficulty of the recipe, especially for an early Friday morning, and my skill level going into the experiment. Both my sister and Mike warned me about the persnickety “rising” element in the equation. I will admit, the first attempt was edible but it wasn’t something to write home about either. I got antsy about the rising and decided to make the rolls the night before, take them out of the fridge in the morning and let them warm to room temperature. I forgot that not only did they need to warm but they would also need additional time at that temperature for RISING. I tried to rush it by placing them in a warm oven — which only pre-cooked them. There was no rising action and the rolls were a bit more done than they needed to be. Rather than writing off cinnamon rolls as not my strong suit, I decided I needed to do it one more time. This time, I got up early and made them from scratch. I let them sit at room temperature for about an hour and a half, enough time for them to rise. I popped them in the oven, reducing the time a bit and pulled out pretty perfect rolls. 1) There’s no need to fear yeast or rising instructions. It just takes a bit of practice. 2) Have patience. Cooking takes time. No need to rush it. It’ll all come out in . . . the oven?